National Bank Limited reaches the milestone of 200th branches. The bank opened its 200th branch at Gulshan (Gulshan Corporate Branch), on Thursday. Director of the bank Ron Haque Sikder formally inaugurated the branches by cutting ribbon. Managing Director (CC) of the bank, Additional Managing Directors, Deputy Managing Director & Head of HRD, SAVP & Manager of Gulshan Corporate Branch D.M. 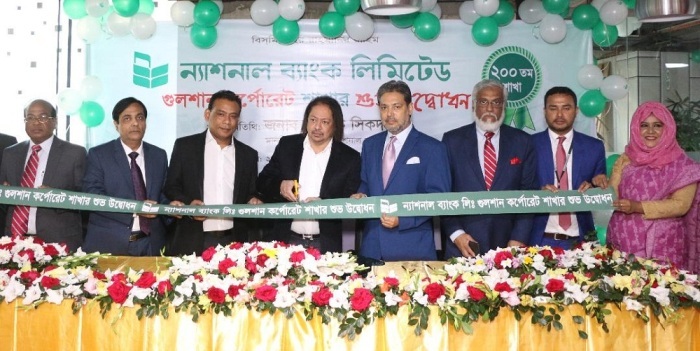 Rafiqul Islam, other officers of the bank, a number of freedom fighters, distinguished local business personnel , social workers, journalists and different professionals were present in the program. In his speech, Director of the bank, Ron Haque Sikder expressed his gratitude to all. He said the authority of the bank is very happy to reach the milestone of 200th branch. He assured quality and modern banking services. He told the audience that National Bank is keen to help grow the industrial and agricultural sector of the country. He expressed that through quality and modern banking services, National Bank will be able to leave a significant mark on the overall economic growth of the country. At last he prayed for the father of the nation and all the martyred freedom fighters and thanked everyone present there.